A social media post without relevant imagery…it’s like apple crumble without custard, like a 99 without a flake, like football without a cup final, or like My Social Agency without our unique agile approach to marketing campaigns. Adding imagery makes a post unquestionably better. But why are images so important? What effect does it have on engagement rates? What sort of imagery should be being used? All these questions and more will be answered…so read on! Firstly, imagery has a significant impact on how information about a brand is recalled by its audience. Source: John Medina, Brain Rules. This demonstrates just how important relevant imagery can be in terms of future brand recognition, which in turn can lead to future purchases, if nurtured correctly. At this point, it’s important to stress the word relevant in the previous sentence. You are not likely to see any sort of benefit to your brand if the imagery you use is irrelevant or is uninteresting to the audience. Therefore you need to carefully consider the type of imagery you are using in order to ensure maximum recognition and recall. This clearly shows just how important imagery can be in creating engagement with your audience, and as we know, increasing your audience engagement can in turn lead to an increase in sales. We’ve made quite a lot of references to ‘relevant’ content, but up until this point, we haven’t given a clear example of what relevant content actually is. In order for content to be considered ‘relevant’ it has to be of interest to your audience, it has to be attractive to them, and it should either inform, educate or compel them to take some sort of action. 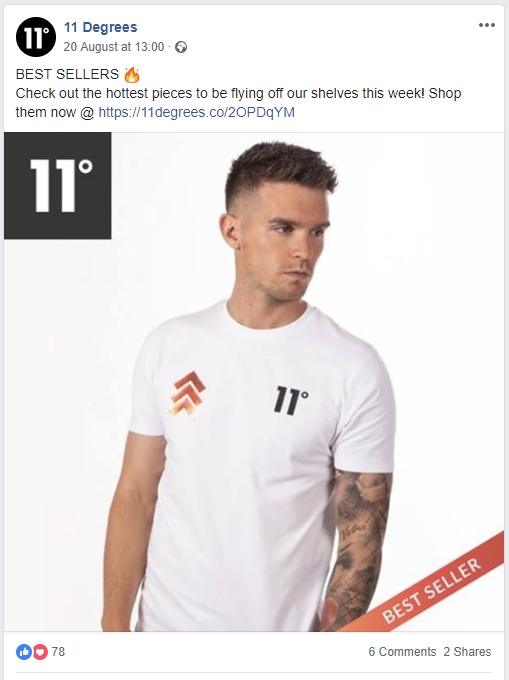 These posts have imagery of a product, a call to action, the images are of high quality and of the right size, and as a result, they are getting a fairly good level of engagement. Both of these examples have been B2C focused. But what of B2B content? 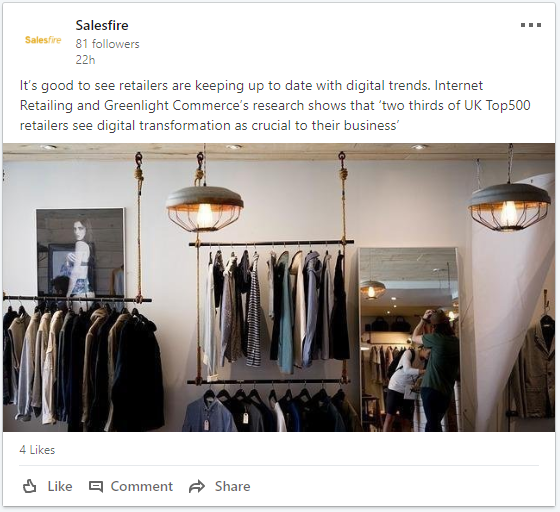 The post is relevant to the company’s audience, as the software they offer helps eCommerce businesses increase their conversion rate, but there is no call to action,and the image is just a stock image. It’s not immediately obvious to the user what the post is about – the company could be selling suits or offering a tailoring service for all they know. There are examples which are a lot worse out there, which include posts with ill-thought out self-created imagery, and posts with images which aren’t the correct size. These can all have a negative impact on your business, as they could potentially make your business seem unprofessional and demonstrate a lack of attention to detail. We recognise that not every business has the time or perhaps financial resource to create imagery of their own, but why not consider hiring a freelance graphic designer who can spend a day or so creating a ‘stock library’ of graphics which are tailored to your business? This is particularly useful if you have a particular range of services and you post about each one individually. There are tools out there which make self-creation of images easy, but we would discourage this. It is very easy to tell the difference between a self-created graphic built in Canva and a carefully considered image created by a designer who is highly skilled, very creative and has access to specialist design software! Of course, some businesses employ agencies to look after their social media, and give them free reign over what gets posted, but this can be uneven ground, particularly as some traditional marketing agencies who just offer social media as a sub-service, often don’t have the resource in-house to create designs. As we’ve mentioned before, this can result in the imagery making your business look unprofessional, particularly in the B2B sector, where the primary publishing platform is LinkedIn. 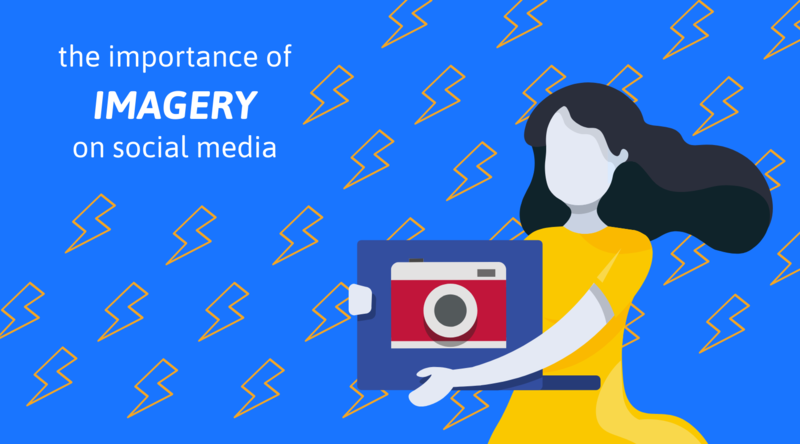 Imagery is undoubtedly an essential part of your posts on social media, but the next time you go to publish, ask yourself two primary questions – “is my chosen image relevant to the post?” and “does my imagery reflect my business’ brand and how I want it to be seen?”.